Bhojpuri actress Monalisa aka Antara Biswas, who is making heads turn with her role as daayan (witch) on her supernatural show Nazar, is leaving no stone unturned to impress her audience with stunts and her sartorial choices. Well, to perform the stunts she needs to be fitter than fit. Now, she took to her Instagram stories to share her early morning workout regime and will definitely motivate you to indulge yourself into some exercises. Dressed in a green tank top and printed leggings, she has accessorised her look with sports shoes and absolutely no makeup. 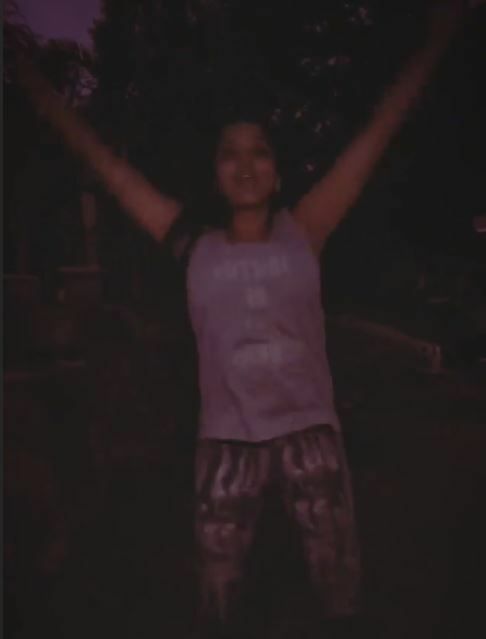 In the pictures, she is spotted stretching and doing some yoga at the wee hours of the morning. Earlier, her video performing a stunt with a sword has gone viral on social media. Dressed in a green salwar-suit, she looks uber hot in her daayan (witch) avatar. The video has been shared by one of her fan pages and the clip does give us sneak peek into the action that will be seen in the coming episodes. Recently, she was also seen partying with the cast of Nazar. In the recently shared pictures by Monalisa, she is slaying in a blue dress with a deep neckline. She has teamed up her look with a pair of earrings, metallic makeup, high heels and red lipstick.